Cars are in Stefan Marjoram’s blood. In this interview, he speaks about this passion, his influences and why he decided to leave an Oscar-winning studio to join the Bloodhound SSC Team, and document the building of a 1000 mph land speed record car. I live not far from Bristol (the one in the UK) where I’ve worked for the past 20 years. I first came to help a friend with an animated film, did computer games for a while and then spent five years doing computer animation – mostly for natural history documentaries. Gradually I realised that I’d rather make funny films and joined Aardman Animations as a Creative Director where I worked on commercials, tv idents and occasionally short films. It’s been terrific fun and I’ve worked with some amazingly talented people on some wonderful projects. As well as animation I’ve long had a passion for cars and I’ve regularly gone off on weekends to various events such as Goodwood or Le Mans to take photos of the cars I dreamed about when I was younger. This lead to occasional professional work for magazines and websites. More recently I’ve been putting down the camera and sketching instead and it’s amazing how it changes the experience. As a photographer you hide behind your viewfinder and observe the whole weekend through that little spy-hole, hardly interacting with anyone. 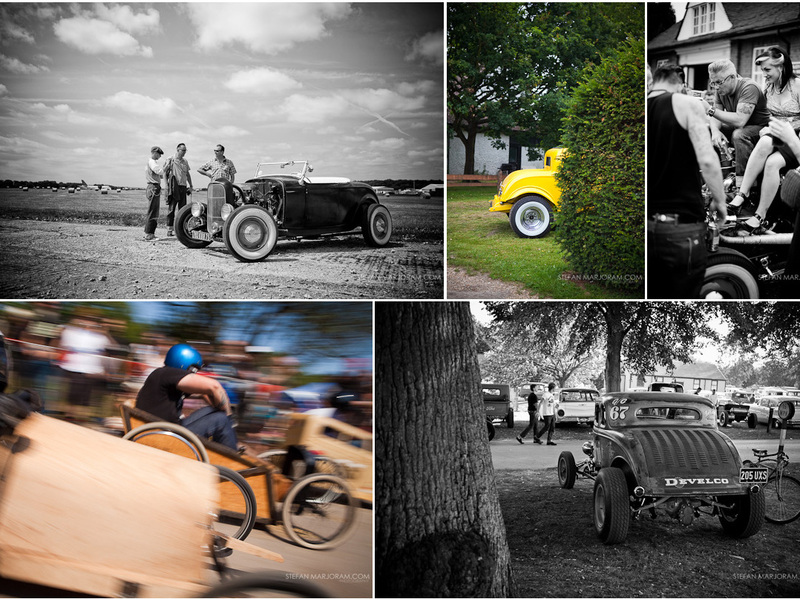 As an artist you perhaps don’t get to view as much but the bits you do see you study in much more detail – and you get to meet and chat to loads of people, finding out about the history of the cars along the way. You return home having felt much more a part of the event. Do you remember the moment when you decided, this is it, I want to do this for the rest of my life? Do I have to pick just one thing?! I’m not sure I could and I certainly haven’t decided what I’m going to do for the rest of my life. I’m always learning, being given new challenges and meeting new people. I know I want to draw, take photos and make films and I’m happy to just see where that takes me. The EJ200 Eurofighter engine. It was used for testing so most of the external cabling is for test sensors. 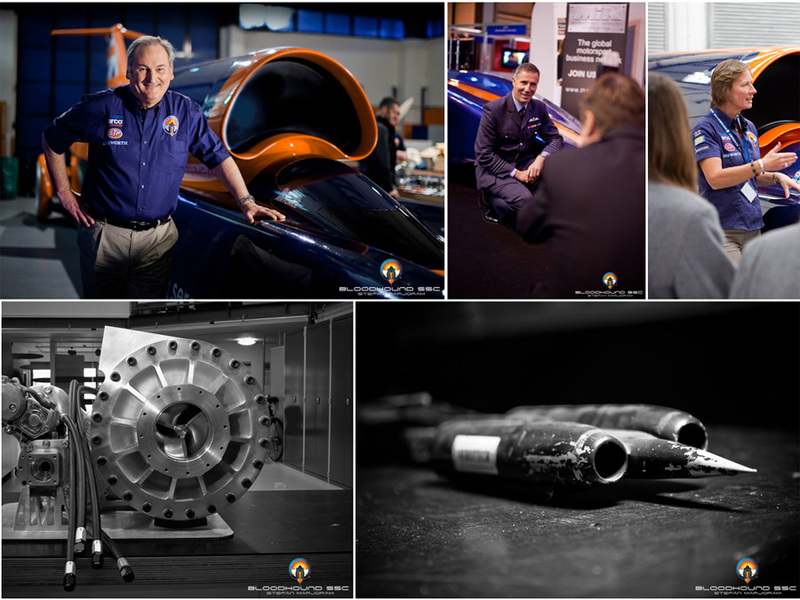 You recently joined Bloodhound SSC Land Speed Record team as their Filmmaker, photographer and artist. How did that come about? And can you tell us about the Bloodhound SSC Team? Sometimes I feel embarrassed about how these things seem to fall at my feet. There I am in my terrific job making cartoons for an Oscar-winning studio when Richard Noble decides to build a 1000mph Land Speed Record car in the building next-door! I got in touch and offered my services as a photographer and illustrator. I thought it would be great to make a diary of the build, it would make a nice book at the end and they might also be able to sell a few prints to help raise a bit of extra cash. Richard really liked the work but had much grander plans – he needed a film maker. He explained how in the past TV crews had turned up at the end of a project, just to film the final runs and make a documentary on the (hopefully) successful event. This served no use to the team as by then, everyone had packed up and gone home to their old jobs. What he needed was someone to make films throughout the project, to let people know what was going on, to entice new sponsors and to help with the educational aspects. The first goal of Bloodhound SSC is surprisingly not to travel at 1000mph but to inspire a new generation to become scientists and engineers. Bloodhound is a great vehicle for this as it encompasses so many mind-boggling challenges and disciplines and we now have over 5,000 schools signed up for the education programme. Everything is totally open-source, you can download the CAD model and build your own car if you like – but the students need to know what is there for them and how to understand it – which is where my new job comes in. Thanks to our sponsors Cisco I’m now on-board full-time. Here's a quick sketch of what's in the workshop at the moment. It's the test-rig that will be connected to the biggest rocket ever fired in Britain. The huge 1000L tank will be filled with HTP and pumped into the rocket by the Cosworth formula 1 engine in just 20 seconds. The team are an amazing bunch of people. Many have backgrounds in aerospace and motor racing and several have been on LSR teams before – It’s a real treat to interview them as part of my film making. I’m also finding it fascinating to travel out to the various manufacturers who are helping to make parts for the car. You do a bit of everything, filmmaker, photographer, traditional art. What’s that like? Well I never get bored. The downside is that when I focus on one of those the others get a bit neglected. I find myself taking lots of photos for a while and then I’m really rusty when it comes to drawing again. Or while I’m making films and drawing a pile of untreated photos is building up on my hard drive. What is it about cars and car racing that you like so much? When I was at school I always wanted to be a car designer. I was told I wasn’t good enough at maths for that so I put it out of my mind and just enjoyed looking at cars instead. It’s still the design that I’m drawn to. Originally it was the beautiful curvy lines of 60’s Italian cars but increasingly it’s the earlier vintage racing cars that I’m attracted to. I love the diversity, the enormous engines, the engineering and the sheer bravery of the drivers. Auto Union, with special streamlined bodywork for high-speed circuits and record breaking. This is a C-type, chassis number 76006/42/24, being driven by the great Bernd Rosemeyer in the AVUSrennen on May 30th 1937. He finished second in his heat and fourth in the final. Perhaps it’s in my blood – one of my grandfathers had a real passion for cars and bikes and even photographed the Auto Unions on their first outing at Avus. I remember him pointing out where Bernd Rosemeyer died as we travelled along the autobahn. My other grandfather was a mechanic and went from patching up Spitfires during the war to building racing cars thereafter. He worked for Coopers, Alan Brown and also Coombs Jaguar before starting his own garage. He was right there during the rear-engine revolution and many of the drivers he worked with went on to form today’s formula one teams. Have your best shots come from pre-planning or by happenstance? There’s often a bit of luck involved – and sometimes it might seem like bad luck to start with. 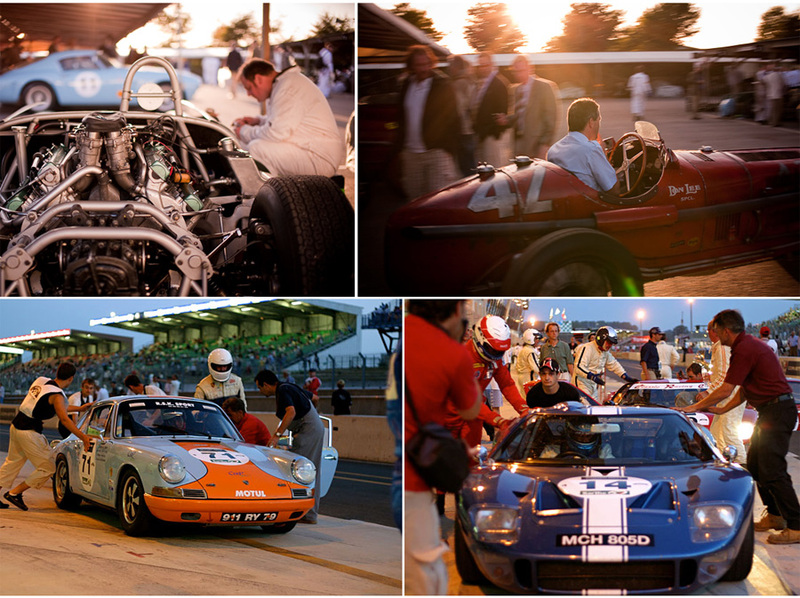 I remember turning up for the 2005 LMES at Silverstone – the first time I’d done a modern endurance event. The rain bucketed down and the race was nearly cancelled. It was hard to keep the camera dry and fog-free but I came away with a couple of nice photos with some really brooding skies which I wouldn’t have got otherwise..
What’s your idea of a good to great shot? When it comes to motorsports photography a great shot is one that’s different from everyone else’s. There are so many photographers at these events and they’ve been photographed so many times. It takes real skill to come away with a different angle. That’s what I admire about Darren Heath’s F1 photos and also Camden Thrasher on flickr – they always manage to surprise me with unusual compositions, seeing the events with an artistic eye. Most challenging shoot you’ve ever done? It’s very rarely challenging as I’m mostly shooting the things I want to shoot – it gets difficult when I’m asked to do portraits or something out of my comfort zone. How does photography inform your filmmaking? Or vice versa? I’m using the same Canon 5D to shoot the Bloodhound films as I’ve been using for stills – so it’s been a relatively easy progression. The tricky thing is getting used to the quality difference. You can push grading of the raw stills so much further than you can the video. There’s a definite skill to it which I still need to learn – so for now I’m playing it fairly safe. You’ve got 30 seconds to leave for a shoot – and can only bring one camera and lens — what do you grab? I’ve got a bag full of lenses and love messing around with some of the whackier ones like a fisheye and home-made tilt-shift but some days I only take the 50mm and it’s quite liberating. After all, it was good enough for Cartier Bresson. If you could shoot any racing event, what would that be and why? Easy, Bonneville Speed Week. I think about it all the time, that amazing light, bizarre landscape and then there’s the cars… I’ll get there soon. What artists out there do you follow? Blimey, there’s a big list down the side of my sketchblog – do have a click-through them. A few that stand out are Alberto Mielgo, Bill Wray, Greyisthecolor on Flickr, Jay Ryan, Nathan Fowkes, Patrick Faulwetter, Roger Law. Bernie Fuchs isn’t around any more but I like his work a lot too. What artist influenced you the most? Bob Freeman, he did the most amazing pencil and watercolour drawings – mostly of engines – for a magazine I got as a teenager called Supercar Classics. I’ve got a print of his on my wall and a couple of postcards on the desk. There was no one else quite like him. Sometimes people mention him when they see my work but mine is nowhere near as accomplished and I’d never try to copy him. I can’t deny that he’s a big influence though. How would your friends and family describe you on a good day? I have a 1981 911 SC which I bought 10 years ago in Germany. It’s a blast to drive and has been very reliable but I only really use it for longer journeys. Most days I drive my Toyota Corolla, and try to make myself feel ok about it by looking at the mpg counter. Favorite racing film of all-time? It’s hard not to say ‘Le Mans’ for the atmospheric scenes at the beginning and the wonderful cars but ‘Closer to the Edge’, a documentary about the Isle of Man TT was just jaw-dropping. I really must see ‘Senna’ too. I have absolutely no idea – I’ll keep drawing and photographing and see where it takes me.